Facebook commissioned a study by the Economist Intelligence Unit (EIU) to understand "internet inclusion" globally, or how people use the Internet, the benefits received, and the obstacles experienced. The latest survey included 5,069 respondents from 100 countries in Asia-Pacific, the Americas, Europe, the Middle East, North Africa and Sub-Saharan Africa. "... cause for both optimism and concern. We are seeing steady progress in the number and percentage of households connected to the Internet, narrowing the gender gap and improving accessibility for people with disabilities. The Internet also has become a crucial tool for employment and obtaining job-related skills. On the other hand, growth in Internet connections is slowing, especially among the lowest income countries, and efforts to close the digital divide are stalling..."
The EIU describes itself as, "the world leader in global business intelligence, to help companies, governments and banks understand changes in the world is changing, seize opportunities created by those changes, and manage associated risks. So, any provider of social media services globally would greatly value the EIU's services. Other benefits respondents said: almost three-quarters (74.4%) said the Internet is more effective than other methods for finding jobs; 70.5% said their job prospects have improved due to the Internet; and more. So, job seekers and employers both benefit. "... More than half (52.2%) of [survey] respondents say they are not confident about their online privacy, hardly changed from 51.5% in the 2018 survey... Most respondents are changing the way they use the Internet because they believe some information may not remain private. For example, 55.8% of respondents say they limit how much financial information they share online because of privacy concerns. This is relatively consistent across different age groups and household income levels... 42.6% say they limit how much personal health and medical information they share. Only 7.5% of respondents say privacy concerns have not changed the way they use the Internet." "Despite lingering privacy concerns, people are increasingly shopping online. Whether this continues in the future may hinge on attitudes toward online safety and security... A majority of respondents say that making online purchases is safe and secure, but, at 58.8% it was slightly lower than the 62.1% recorded in the 2018 survey." "In Europe, the share of respondents confident about their online privacy increased by 8 percentage points from the 2018 survey, probably because of the General Data Protection Regulation (GDPR), the EU’s comprehensive data privacy rules that came into force in May 2018. However, the Middle East and North Africa region saw a decline of 9 percentage points compared with the 2018 survey." "Trust in online sources of information remained relatively stable, except in the West. Political turbulence in the US and UK may have played a role in causing the share of respondents in North America and Europe who say they trust information on government websites and apps to retreat by 10 percentage points and 6 percentage points, respectively, compared with the 2018 survey." "The survey also reflects anxiety about online privacy and a decline in trust in some sources of information. Indeed, trust in government information has fallen since last year in Europe and North America. The growth and importance of the digital economy will mean that alleviating these anxieties should be a priority of companies, governments, regulators and developers." Addressing those anxieties is critical, if governments in the West are serious about facilitating business growth via consumer confidence and internet usage. Download the Inclusive Internet Index 2019 Executive Summary (Adobe PDF) report. "... nearly 30% of respondents admitted to using tracking apps to catch a partner [suspected of or cheating]. After all, over a quarter of those caught cheating were busted by modern technology... 85% of those caught out in the past now take additional steps to protect their privacy, including deleting their browsing data or using a private browsing mode." 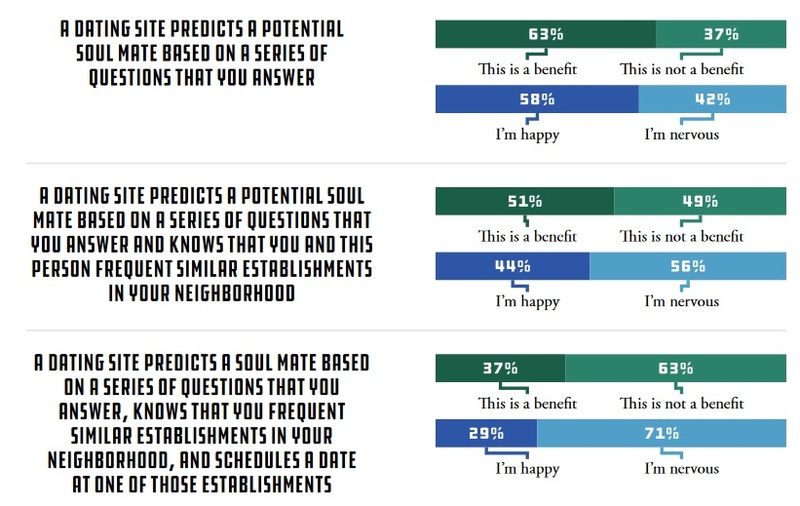 Below is an infographic with more findings from the survey. "... romance scams generated more reported losses than any other consumer fraud type reported to the agency... The number of romance scams reported to the FTC has grown from 8,500 in 2015 to more than 21,000 in 2018, while reported losses to these scams more than quadrupled in recent years—from $33 million in 2015 to $143 million last year. For those who said they lost money to a romance scam, the median reported loss was $2,600, with those 70 and over reporting the biggest median losses at $10,000." "Romance scammers often find their victims online through a dating site or app or via social media. These scammers create phony profiles that often involve the use of a stranger’s photo they have found online. The goals of these scams are often the same: to gain the victim’s trust and love in order to get them to send money through a wire transfer, gift card, or other means." So, be careful out there. Don't cheat, and beware of scammers and dating imposters. You have been warned. "... Maciej Szpunar, an advisor to the highest court in the EU, sided with Google in the fight, arguing that the right to be forgotten should only be enforceable in Europe -- not the entire world. The opinion is non-binding, but seen as likely to be followed." "... was created in 2014, when EU judges ruled that Google (and other search engines) must remove links to embarrassing information about Europeans at their request... The right to be forgotten doesn't exist in the United States... Google interpreted the EU's ruling as requiring removal of links to material in search engines designed for European countries but not from its worldwide search results... In 2015, French regulators rejected Google's position and ordered the company to remove material from all of its results pages. Google then asked Europe's highest court to reject that view. The company argues that no one country should be able to censor the web internationally." "A new poll shows a slim majority of Canadians agree with the concept known as the “right to be forgotten online.” This means the right to have outdated, inaccurate, or no longer relevant information about yourself removed from search engine results. The poll by the Angus Reid Institute found 51 percent of Canadians agree that people should have the right to be forgotten..."
Consumers should have control over their information. If that control is limited to only the country of their residence, then the global nature of the internet means that control is very limited -- and probably irrelevant. What are your opinions? Experts predict that there will be 10 million self-driving cars on the roads by 2020. Any outstanding issues need to be resolved before then. One outstanding issue is the "trolley problem" - a situation where a fatal vehicle crash can not be avoided and the self-driving car must decide whether to save the passenger or a nearby pedestrian. Ethical issues with self-driving cars are not new. There are related issues, and some experts have called for a code of ethics. Like it or not, the software in self-driving cars must be programmed to make decisions like this. Which person in a "trolley problem" should the self-driving car save? In other words, the software must be programmed with moral preferences which dictate which person to sacrifice. The answer is tricky. You might assume: always save the driver, since nobody would buy self-driving car which would kill their owners. What if the pedestrian is crossing against a 'do not cross' signal within a crosswalk? Does the answer change if there are multiple pedestrians in the crosswalk? What if the pedestrians are children, elders, or pregnant? Or a doctor? Does it matter if the passenger is older than the pedestrians? Sparing those with higher social status versus lower social status." Besides recording the accident choices, the researchers also collected demographic information (e.g., gender, age, income, education, attitudes about religion and politics, geo-location) about the survey participants, in order to identify clusters: groups, areas, countries, territories, or regions containing people with similar "moral preferences." "The study is basically trying to understand the kinds of moral decisions that driverless cars might have to resort to," Edmond Awad, lead author of the study from the MIT Media Lab, said in a statement. "We don't know yet how they should do that." "First, human lives should be spared over those of animals; many people should be saved over a few; and younger people should be preserved ahead of the elderly." "... given the strong preference for sparing children, policymakers must be aware of a dual challenge if they decide not to give a special status to children: the challenge of explaining the rationale for such a decision, and the challenge of handling the strong backlash that will inevitably occur the day an autonomous vehicle sacrifices children in a dilemma situation." "The first cluster (which we label the Western cluster) contains North America as well as many European countries of Protestant, Catholic, and Orthodox Christian cultural groups. The internal structure within this cluster also exhibits notable face validity, with a sub-cluster containing Scandinavian countries, and a sub-cluster containing Commonwealth countries. The second cluster (which we call the Eastern cluster) contains many far eastern countries such as Japan and Taiwan that belong to the Confucianist cultural group, and Islamic countries such as Indonesia, Pakistan and Saudi Arabia. The third cluster (a broadly Southern cluster) consists of the Latin American countries of Central and South America, in addition to some countries that are characterized in part by French influence (for example, metropolitan France, French overseas territories, and territories that were at some point under French leadership). Latin American countries are cleanly separated in their own sub-cluster within the Southern cluster." "... systematic differences between individualistic cultures and collectivistic cultures. Participants from individualistic cultures, which emphasize the distinctive value of each individual, show a stronger preference for sparing the greater number of characters. Furthermore, participants from collectivistic cultures, which emphasize the respect that is due to older members of the community, show a weaker preference for sparing younger characters... prosperity (as indexed by GDP per capita) and the quality of rules and institutions (as indexed by the Rule of Law) correlate with a greater preference against pedestrians who cross illegally. In other words, participants from countries that are poorer and suffer from weaker institutions are more tolerant of pedestrians who cross illegally, presumably because of their experience of lower rule compliance and weaker punishment of rule deviation... higher country-level economic inequality (as indexed by the country’s Gini coefficient) corresponds to how unequally characters of different social status are treated. Those from countries with less economic equality between the rich and poor also treat the rich and poor less equally... In nearly all countries, participants showed a preference for female characters; however, this preference was stronger in nations with better health and survival prospects for women. In other words, in places where there is less devaluation of women’s lives in health and at birth, males are seen as more expendable..."
This is huge. It makes one question the wisdom of a one-size-fits-all programming approach by AV makers wishing to sell cars globally. Citizens in clusters may resent an AV maker forcing its moral preferences upon them. Some clusters or countries may demand vehicles matching their moral preferences. "Never in the history of humanity have we allowed a machine to autonomously decide who should live and who should die, in a fraction of a second, without real-time supervision. We are going to cross that bridge any time now, and it will not happen in a distant theatre of military operations; it will happen in that most mundane aspect of our lives, everyday transportation. Before we allow our cars to make ethical decisions, we need to have a global conversation to express our preferences to the companies that will design moral algorithms, and to the policymakers that will regulate them... Our data helped us to identify three strong preferences that can serve as building blocks for discussions of universal machine ethics, even if they are not ultimately endorsed by policymakers: the preference for sparing human lives, the preference for sparing more lives, and the preference for sparing young lives. Some preferences based on gender or social status vary considerably across countries, and appear to reflect underlying societal-level preferences..."
"Even with a sample size as large as ours, we could not do justice to all of the complexity of autonomous vehicle dilemmas. For example, we did not introduce uncertainty about the fates of the characters, and we did not introduce any uncertainty about the classification of these characters. In our scenarios, characters were recognized as adults, children, and so on with 100% certainty, and life-and-death outcomes were predicted with 100% certainty. These assumptions are technologically unrealistic, but they were necessary... Similarly, we did not manipulate the hypothetical relationship between respondents and characters (for example, relatives or spouses)... Indeed, we can embrace the challenges of machine ethics as a unique opportunity to decide, as a community, what we believe to be right or wrong; and to make sure that machines, unlike humans, unerringly follow these moral preferences. We might not reach universal agreement: even the strongest preferences expressed through the [survey] showed substantial cultural variations..."
Several important limitations to remember. And, there are more. It didn't address self-driving trucks. Should an AV tractor-trailer semi -- often called a robotruck -- carrying $2 million worth of goods sacrifice its load (and passenger) to save one or more pedestrians? What about one or more drivers on the highway? Does it matter if the other drivers are motorcyclists, school buses, or ambulances? What about autonomous freighters? Should an AV cargo ship be programed to sacrifice its $80 million load to save a pleasure craft? Does the size (e.g., number of passengers) of the pleasure craft matter? What if the other craft is a cabin cruiser with five persons? Or a cruise ship with 2,000 passengers and a crew of 800? What happens in international waters between AV ships from different countries programmed with different moral preferences? Regardless, this MIT research seems invaluable. It's a good start. AV makers (e.g., autos, ships, trucks) need to explicitly state what their vehicles will (and won't do). Don't hide behind legalese similar to what exists today in too many online terms-of-use and privacy policies. Hopefully, corporate executives and government policymakers will listen, consider the limitations, demand follow-up research, and not dive headlong into the AV pool without looking first. After reading this study, it struck me that similar research would have been wise before building a global social media service, since people in different countries or regions having varying preferences with online privacy, sharing information, and corporate surveillance. What are your opinions? "Amazon Alexa and Google Assistant have the highest satisfaction levels among mobile users, each with an 85% satisfaction rating, followed by Siri and Bixby at 78% and Microsoft’s Cortana at 77%... As found in other studies, virtual assistants are being used for a range of things, including looking up things on the internet (51%), listening to music (48%), getting weather information (46%) and setting a timer (35%)... Smart speaker usage varies, with 31% of Amazon device owners using their speaker at least a few times a week, Google Home owners 25% and Apple HomePod 18%." "Only 10% of surveyed respondents were not familiar with voice-enabled products and devices. Of the 90% who were, the majority have used a voice assistant (72%). Adoption is being driven by younger consumers, households with children, and households with an income of >$100k... Despite being accessible everywhere, three out of every four consumers (74%) are using their mobile voice assistants at home..."
"... the bulk of consumers have yet to graduate to more advanced activities like shopping or controlling other smart devices in the home... 50% of respondents have made a purchase using their voice assistant, and an additional 25% would consider doing so in the future. The majority of items purchased are small and quick.. Usage will continue to increase but consistency must improve for wider adoption... Some consumers see voice assistants as a privacy risk... 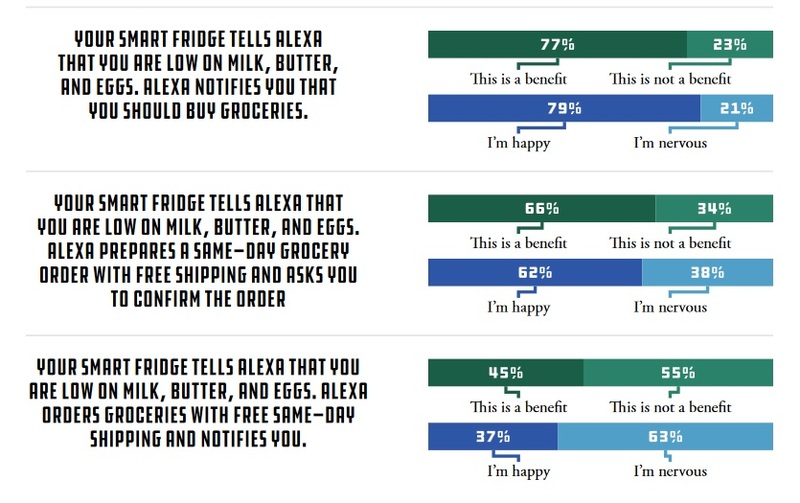 When forced to choose, 57% of consumers said they would rather watch an ad in the middle of a TV show than listen to an ad spoken by their voice assistant..."
Consumers want control over the presentation of advertisements by voice assistants. Control options desired include skip, select, never while listening to music, only at pre-approved times, customized based upon interests, seamless integration, and match to preferred brands. 38 percent of survey respondents said that they, "don't want something 'listening in' on my life all the time." What are your preferences with voice assistants? Any privacy concerns? More than one-third of counties that are overseeing elections in some of the most contested congressional races this November run email systems that could make it easy for hackers to log in and steal potentially sensitive information. A ProPublica survey found that official email accounts used by 11 county election offices, which are in charge of tallying votes in 12 key U.S. House of Representatives races from California to Ohio, could be breached with only a user name and password — potentially allowing hackers to vacuum up confidential communications or impersonate election administrators. Cybersecurity experts recommend having a second means of verifying a user’s identity, such as typing in an additional code from a smartphone or card, to thwart intruders who have gained someone’s login credentials through trickery or theft. This system, known as two-factor verification, is available on many commercial email services. The email vulnerabilities emerged in ProPublica’s survey of election security in 27 counties encompassing all or part of roughly 40 congressional districts that the Cook Political Report has said are toss-ups. These contests could determine if Democrats take control the U.S. House of Representatives, where the party needs to pick up about two dozen seats to flip the current Republican majority. Of the 12 districts in counties with less protected email systems, Republicans are seeking re-election in 10. The other two are open seats where incumbents are stepping down. Much attention has focused on the potential to hack voting machines. In the “Voting Village” at the Def Con security conference this summer in Las Vegas, hackers sought to compromise a handful of machines. But lax protections for internet-connected systems like email servers may pose just as serious a threat. The lack of two-factor verification may have helped Russian hackers ultimately gain access to the Democratic National Committee’s network in April 2016, according to a federal indictment. Prosecutors say a Democratic campaign employee unwittingly put her password into a spearphishing email – a targeted message meant to dupe users into sharing their login information. Russian hackers also tricked John Podesta, Hillary Clinton’s campaign chairman, into handing over his password, enabling an embarrassing leak of his emails weeks before the election. Even a program created by the Kansas secretary of state’s office to prevent voter fraud was vulnerable to snooping, ProPublica reported last year. The program, Crosscheck, sought to identify voters casting ballots in more than one state by comparing the rolls across states. But its files were hosted on an insecure server, and program officials regularly shared user names and passwords—many of them overly simplistic—for the site by email as late as 2017. Crosscheck paused operations in 2018 because of concerns about security and accuracy, and it is unclear when it will begin matching rolls again. The Kansas Secretary of State’s office did not return a request for comment. A different kind of cyber-attack in 2016 manipulated the software code behind Illinois’ voter-registration system to expose the personal details of thousands of people. Matt Dietrich, a spokesman for the state board of elections, said the flaws that allowed the penetration have been fixed. Special counsel Robert Mueller charged 12 Russians this past July in connection with an unspecified breach that Illinois officials said was very likely the attack on the voter registration database. Using a checklist developed by Harvard’s Belfer Center for Science and International Affairs, ProPublica asked county election officials about their email systems, as well as about cybersecurity protections for voting machines and computers that check in voters at polling sites. Voter registration is generally handled at the state level, while counties administer elections and are responsible for protecting voting machines and verifying end-of-night vote tallies that determine winners. Funded by local taxes, counties are generally run by elected commissioners and often have centralized IT staff overseeing email services for departments ranging from the medical examiner to public works. As a result, elections officials have to compete for IT resources and attention. The counties with vulnerable email systems ranged in population from Orange County, California, with 3.1 million people to Olmsted County, Minnesota, with 155,000. Orange County elections director Neal Kelley said he’d prefer to have two-factor authentication. It hasn’t been implemented yet, but is “on the short horizon,” he said. There are two toss-up House races in Orange County. Noah Praetz, the director of elections for Cook County, Illinois, except the city of Chicago, said his office “lacks a little bit of control” when it comes to changing IT systems because the county-run network serves more than 24,000 employees. He said the county government doesn’t require two-factor authentication for employees to log into emails. One county reported two problems. Fayette County, Kentucky, which includes Lexington, told ProPublica its electronic voting machines don’t produce a separate paper trail for voters to verify their choices. Nor does it use two-factor authentication on its email system. Fayette, one of the state’s largest counties, is home to a chunk of Kentucky’s 6th congressional district, where a once-safe Republican incumbent is facing an unexpectedly competitive challenger. Besides Orange, Olmsted, Cook, and Fayette, the counties without two-factor authentication were: Arapaho County, Colorado; Linn County, Hennepin County, and Dakota County, Minnesota; Hamilton County, Ohio; King County, Washington; and Harris County, Texas. Some counties have secured their emails but had other shortcomings. Shawnee County, Kansas, said it doesn’t yet have countermeasures to stop hackers from bringing down its website by overloading it with malicious traffic. If such a denial-of-service attack takes the site offline, election commissioner Andrew Howell said, officials would instead publish election results on social media. Five of the 27 counties surveyed did not respond to multiple emails or phone calls from ProPublica: Polk County, Iowa; St. Louis County, Minnesota; Ocean County and Essex County, New Jersey; and Oneida County, New York. U.S. law enforcement officials and cybersecurity experts have been working with states in the months leading up to the November midterms to improve election security. States are using some of the $380 million in newly earmarked federal funds to test for vulnerabilities and recruit and train IT staff, according to congressional testimony from the National Association of Secretaries of State. Fixing technical problems isn’t cheap, and county governments have had to make hard choices when prioritizing spending. Tammy Patrick, a former election administrator in Arizona and now a senior adviser at the nonprofit Democracy Fund, said counties may consider it more urgent to replace outdated voting machines than to fix email systems. Ally Levine, Lilia Chang and Blake Paterson contributed to this report. "Most consumers are conflicted about AI. They know there are benefits, but recognize the risks, too"
73 percent of survey participants (e.g., Strongly Agree, Agree) fear "some companies will go too far with AI"
64 percent agreed (e.g., Strongly Agree, Agree) with the statement: "I'm concerned about how companies will use artificial intelligence and the information they have about me to engage with me"
"Six out of 10 Americans agree or strongly agree that AI will never be as good as human interaction. Human interaction remains sacred and there is concern with at least a third of consumers that AI won’t stay focused on mundane tasks and leave the real thinking to humans." Download Elicit Insights' complete Artificial Intelligence survey (Adobe PDF). What are your opinions? Do you prefer AI applications that operate independently, or which require your authorization? A global survey recently uncovered interesting findings about the usage and satisfaction of Iot (Internet of things) devices by consumers. A survey of consumers in several countries found that 52 percent already use IoT devices, and 64 percent of users have already encountered performance issues with their devices. "On average, consumers experience 1.5 digital performance problems every day, and 62% of people fear the number of problems they encounter, and the frequency, will increase due to the rise of IoT." "The digital performance failures consumers are already experiencing with everyday technology is potentially making them wary of other uses of IoT. 85% of respondents said they are concerned that self-driving cars will malfunction... 72% feel it is likely software glitches in self-driving cars will cause serious injuries and fatalities... 84% of consumers said they wouldn’t use self-driving cars due to a fear of software glitches..."
"... 62% of consumers stated they would not trust IoT devices to administer medication; this sentiment is strongest in the 55+ age range, with 74% expressing distrust. There were also specific concerns about the use of IoT devices to monitor vital signs, such as heart rate and blood pressure. 85% of consumers expressed concern that performance problems with these types of IoT devices could compromise clinical data..."
"... 83% of consumers are concerned about losing control of their smart home due to digital performance problems... 73% of consumers fear being locked in or out of the smart home due to bugs in smart home technology... 68% of consumers are worried they won’t be able to control the temperature in the smart home due to malfunctions in smart home technology... 81% of consumers are concerned that technology or software problems with smart meters will lead to them being overcharged for gas, electricity, and water." The findings are a clear call to IoT makers to improve the performance, security, and reliability of their internet-connected devices. To learn more, download the full Dynatrace report titled, "IoT Consumer Confidence Report: Challenges for Enterprise Cloud Monitoring on the Horizon." WalletHub found that women were twice as likely as men to have the above fear. Millennials were five times as likely than Baby Boomers to have this fear. More findings are listed below. It is important for consumers to understand the industry. Inaccurate credit report can lower your credit score, the overall number used to indicate your credit worthiness. A low credit score can cost you money: denied credit applications, or approved loans but with higher interest rates. The errors in credit reports can include another person's data co-mingled with yours (obviously, that should never happen), a dead person's data co-mingled with yours, or a credit report that doesn't accurately reflect a loan you truly paid off on time and in full. A 2013 study by the U.S. Federal Trade Commission (FTC) found problems with credit reports accuracy. First, 26 percent of participants identified errors in their credit reports. So, one in four consumers were affected. Plus, of the 572 credit reports where errors were identified, 399 reports (70%) were modified by a credit reporting agency, and 211 (36%) resulted in a credit score changed. So, finding and reporting errors is beneficial for consumers. Plus, a report in 2013 by the 60 Minutes television news magazine listed problems with the dispute process: failures by the largest three credit reporting agencies to correct errors reported by consumers on their credit reports. There are national and regional credit reporting agencies. The three national credit reporting agencies include Experian, Equifax, andTransUnion. Equifax operates a secondary consumer reporting agency focused solely upon the telecommunications industry and broadband internet services. Credit reporting agencies get their data from a variety of sources including data brokers. So, their business model is based upon data sharing. Just about anyone can set up and operate a credit reporting agency. No special skills nor expertise are required. Credit reporting agencies make money by selling credit reports to lenders. Credit reports often contain errors. For better or worse regarding security, credit reporting agencies historically have outsourced work, sometimes internationally. The industry and executives have arguably lackadaisical data security approaches. A massive data breach at Equifax affected about 143 million persons in 2017. An independent investigation of that breach found a length list of data security flaws and failures at Equifax. To compound matters, the Internal Revenue Service gave Equifax a no-bid contract in 2017. The industry has a spotty history. In 2007, Equifax paid a $2.7 million fine for violating federal credit laws. In 2009, it paid a $65,000 fine to the state of Indiana for violating the state's security freeze law. In 2012, Equifax and some of its customers paid $1.6 million to settle allegations of improper list sales. A data breach at Experian in 2015 affected 15 million wireless carrier customers. In 2017, Equifax and TransUnion paid $23.1 million to settle allegations of deceptive advertising about credit scores. See the graphic below for more findings from the WalletHub survey. The current fast-paced news environment, multitude of online sources, and the rise of "fake news" all place a premium upon being able to distinguish facts from opinions. And some opinions are also rumors or lies. Nobody wants to be duped as this shooter was in the Washington pizzeria attack in 2016. Nobody wants to waste their votes based upon misinformation. "... whether member of the public can recognize news as factual – something that’s capable of being proved or disproved by objective evidence – or as an opinion that reflects the beliefs and values of whoever expressed it." "The main portion of the study, which measured the public’s ability to distinguish between five factual statements and five opinion statements, found that a majority of Americans correctly identified at least three of the five statements in each set. But this result is only a little better than random guesses. Far fewer Americans got all five correct, and roughly a quarter got most or all wrong." "Those with high political awareness, those who are very digitally savvy and those who place high levels of trust in the news media are better able than others to accurately identify news-related statements as factual or opinion... 36% of Americans with high levels of political awareness (those who are knowledgeable about politics and regularly get political news) correctly identified all five factual news statements, compared with about half as many (17%) of those with low political awareness. 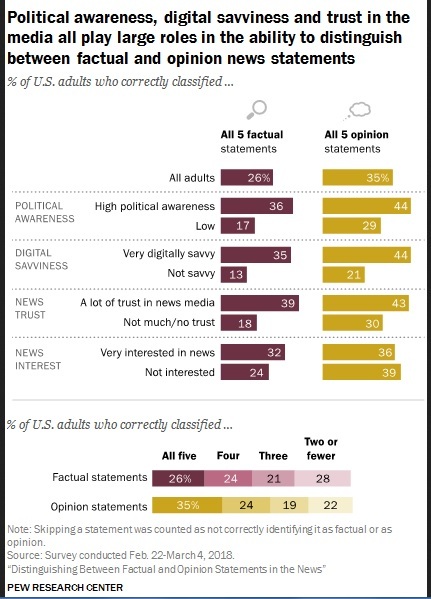 Similarly, 44% of the very digitally savvy (those who are highly confident in using digital devices and regularly use the internet) identified all five opinion statements correctly versus 21% of those who are not as technologically savvy... Trust in those who do the reporting also matters in how that statement is interpreted. Almost four-in-ten Americans who have a lot of trust in the information from national news organizations (39%) correctly identified all five factual statements, compared with 18% of those who have not much or no trust. " "Both Republicans and Democrats show a propensity to be influenced by which side of the aisle a statement appeals to most. For example, members of each political party were more likely to label both factual and opinion statements as factual when they appealed more to their political side." "Overall, attributing the statements to news outlets had a limited impact on statement classification... Members of the two parties were as likely as each other to correctly classify the factual statements when no source was attributed or when USA Today or The New York Times was attributed. Labeling statements with a news outlet had no impact on how Republicans or Democrats classified the opinion statements." When the source was attributed to Fox News, "Republicans were modestly more likely than Democrats to accurately classify the three factual statements... correspondingly, Democrats were modestly less likely than Republicans to do so. "When Americans see a news statement as factual, they overwhelmingly also believe it to be accurate. This is true for both statements they correctly and incorrectly identified as factual, though small portions of the public did call statements both factual and inaccurate." Many people I know strongly believe that persons in the other political party are misinformed and/or misled by their reliance upon opinions, rumors, and inaccurate information; while persons in their political party are uniquely informed without reliance upon opinions, rumors, and inaccurate information. We now know that belief isn't accurate. 3. Only a quarter of Americans (26 percent) can name all three branches of government." "In fact, immigrants who are in the United States illegally share some constitutional protections with U.S. citizens. More than a century ago, in Yick Wo v. Hopkins (1886), a case involving a Chinese immigrant, the Supreme Court ruled that non-citizens were entitled to due process rights under the 14th Amendment’s equal protection clause. Other cases have expanded upon those rights..."
"Most respondents, though not all, know that under the Constitution, U.S. citizens who are atheists or Muslim have the same rights as all other citizens. Seventy-nine percent of respondents know it is accurate to say that U.S. citizens who are atheists have the same rights as other citizens, and 76 percent know it is accurate to say that citizens who are Muslim have the same rights as other citizens." "Nearly half of those surveyed (48 percent) say that freedom of speech is a right guaranteed by the First Amendment. But, unprompted, 37 percent could not name any First Amendment rights. And far fewer people could name the other First Amendment rights: 15 percent of respondents say freedom of religion; 14 percent say freedom of the press; 10 percent say the right of assembly; and only 3 percent say the right to petition the government... Contrary to the First Amendment, 39 percent of Americans support allowing Congress to stop the news media from reporting on any issue of national security without government approval. That was essentially unchanged from last year..."
So, many Americans fail to understand the law of the land -- the U.S. Constitution -- and some naively (or stupidly) support actions to restrict their rights. "Protecting the rights guaranteed by the Constitution presupposes that we know what they are. The fact that many don’t is worrisome... These results emphasize the need for high-quality civics education in the schools and for press reporting that underscores the existence of constitutional protections." I agree. These results are embarrassing, too. What do you think? A recent survey of consumers in six countries found that 90 percent believe it is important for smart devices to have security built into the products. 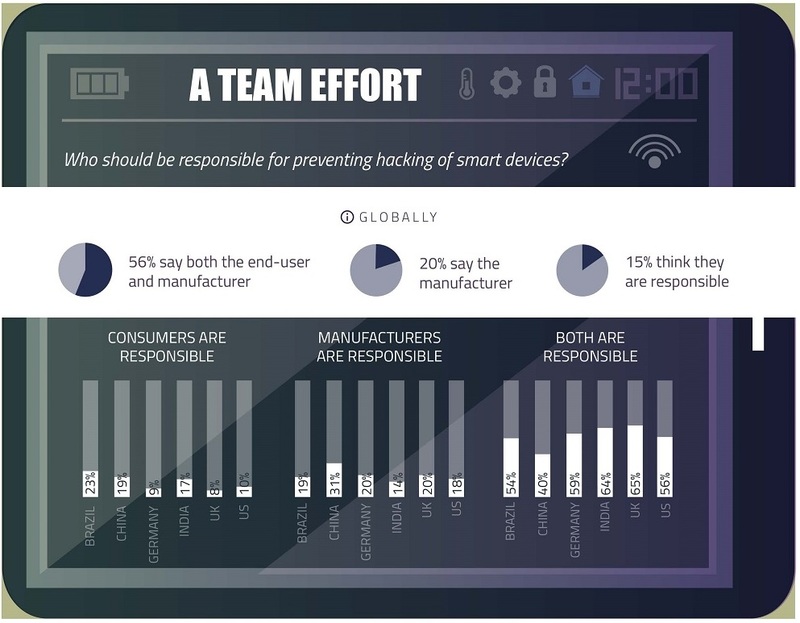 Also, 78 percent said they are aware that any smart device connected to their home WiFi network is vulnerable to attacks by hackers wanting to steal personal data stored on the device. The Irdeto Global Consumer IoT Security Survey, conducted online from June 22, 2017 to July 10, 2017 by YouGov Plc for Irdeto, included 7,882 adults (aged 18 or older) in six countries: Brazil, China, Germany, India, United Kingdom, and United States. Irdeto provides security solutions to protect platforms and applications for media, entertainment, automotive and Internet-of-things (IoT) connected industries. "Regarding the number of smart devices consumers own, 89% of those surveyed have at least one connected device in their home. In addition, 81% of consumers across the globe admitted to having more than one connected device in the home. India led all countries with a staggering 97% of consumers stating that they have at least one smart device in the home, compared to only 80% of US consumers..."
Read the announcement by Irdeto. View the full infographic. What is online life like for many United States residents? A recent survey by the Pew Research Center provides a good view. 41 percent of adults surveyed have personally experienced online harassment. Even more, 66 percent, witnessed online harassment directed at others. The types of online harassment behaviors vary from the less severe (e.g., offensive name calling, efforts to embarrass someone) to the more severe (e.g., physical threats, harassment over a sustained period, sexual harassment, stalking.) 18 percent of survey participants -- nearly one out of every fiver persons -- reported that they had experienced severe behaviors. Americans reported that social networking sites are the most common locations for online harassment experiences. Of the 41 percent of survey participants who personally experienced online harassment, most of those (82 percent) cited a single site and 58 percent cited "social media." The reasons vary. 14 percent of survey respondents reported they had been harassed online specifically because of their politics; 9 percent reported that they were targeted due to their physical appearance; e percent said they were targeted due to their race or ethnicity; and 8 percent said they were targeted due to their gender. 5 percent said they were targeted due their religion, and 3 percent said they were targeted due to their sexual orientation. "... one-in-four blacks say they have been targeted with harassment online because of their race or ethnicity, as have one-in-ten Hispanics. The share among whites is lower (3%). Similarly, women are about twice as likely as men to say they have been targeted as a result of their gender (11% vs. 5%). Men, however, are around twice as likely as women to say they have experienced harassment online as a result of their political views (19% vs. 10%). Similar shares of Democrats and Republicans say they have been harassed online..."
"... ranging from mental or emotional stress to reputational damage or even fear for one’s personal safety. At the same time, harassment does not have to be experienced directly to leave an impact. Around one-quarter of Americans (27%) say they have decided not to post something online after witnessing the harassment of others, while more than one-in-ten (13%) say they have stopped using an online service after witnessing other users engage in harassing behaviors..."
And, attitudes vary by gender. See the table on the right. 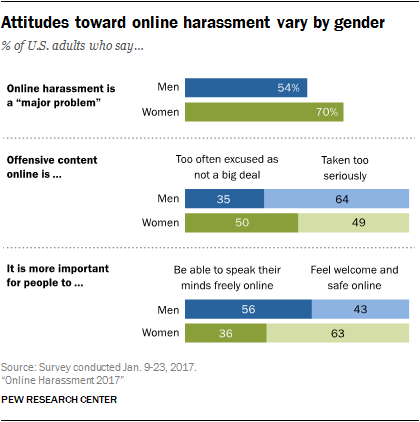 More women than men consider online harassment a "major problem," and men prioritize free speech over online safety while women prioritize safety first. And, 83 percent of young women (e.g., ages 18 - 29) viewed online harassment as a major problem. Perhaps most importantly, persons who have "faced severe forms of online harassment differ in experiences, reactions, and attitudes." Pew Research also found that persons who experience severe forms of online harassment, "are more likely to be targeted for personal characteristics and to face offline consequences." So, what happens online doesn't necessarily stay online. The perpetrators vary, too. Of the 41 percent of survey participants who personally experienced online harassment, 34 percent said the perpetrator was a stranger, and 31 percent said they didn't know the perpetrator's real identity. Also, 26 percent said the perpetrator was an acquaintance, followed by friend (18 percent), family member, (11 percent), former romantic partner (7 percent), and coworker (5 percent). Pew Research found that the number of Americans who experienced online harassment has increased slightly from 35 percent during a 2014 survey. Pew Research Center surveyed 4,248 U.S. adults during January 9 - 23, 2017. 62 percent of survey participants view online harassment as a major problem. 5 percent do not consider it a problem at all. People who have experienced severe forms of online harassment said that they have already taken action. Those actions include a mix: a) set up or adjust privacy settings for their profiles in online services, b) reported offensive content to the online service, c) responded directly to the harasser, d) offered support to others targeted, e) changed information in their online profiles, and f) stopped using specific online services. Views vary about which entities bear responsibility for solutions. 79 percent of survey respondents said that online services have a duty to intervene when harassment occurs on their service. 35 percent believe that better policies and tools from online services are the best way to address online harassment. "... a sizable proportion of Americans (43%) say that law enforcement currently does not take online harassment incidents seriously enough." Among persons who have experienced severe forms of online harassment, 55 percent said that law enforcement does not take the incidents seriously enough. Compare that statistic with this: nearly three-quarters (73 percent) of young men (ages 18 - 29) feel that offensive online content is taken too seriously. "When asked how they would prioritize these competing interests, 45% of Americans say it is more important to let people speak their minds freely online; a slightly larger share (53%) feels that it is more important for people to feel welcome and safe online. Americans are also relatively divided on just how seriously offensive content online should be treated. Some 43% of Americans say that offensive speech online is too often excused as not being a big deal, but a larger share (56%) feel that many people take offensive content online too seriously." With such divergent views, one wonders if the problem of online harassment can be easily solved. What are your opinions about online harassment? A recent poll found that the Republican rollback of broadband privacy rules is very unpopular. Very unpopular. The poll included 1,000 Americans, and the results cut across age, gender, and political affiliations. Despite this, President Trump signed the privacy-rollback legislation on April 3. Since then, many consumers have sought online tools to protect their privacy. 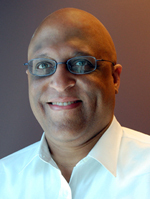 "We write to ensure that the Federal Communications Commission (FCC) stands ready to protect consumer privacy... The Federal Trade Commission (FTC) has long been the standard bearer for striking the right balance of consumer protection with a pro-innovative construct that encourages consumer choice, opportunities, and new jobs... An FCC approach that mirrors the FTC will continue to protect consumers in this tumultuous time... Until such time as the FCC rectifies the Title II reclassification that inappropriately removed ISPs from the FTC's jurisdiction, we urge the FCC to hold Internet service providers (ISPs) to their privacy promises..."
The letter was signed by Greg Walden (Chairman, Committee on Energy & Commerce), Marsha Blackburn (Chairman, Subcommittee on Communications & Technology), and 48 other representatives. Tumultuous times? The tumult was created by the rollback of privacy rules -- a situation created by Republicans. All would have been fine if they'd left the FCC's broadband privacy rules in place; rules consumers clear want -- rules that keep users in control of their online privacy. Clearly, the FCC had to act, it did, it held hearings, and then finalized improved broadband privacy rules to help consumers. Now, the Congress and President undid all of that creating the tumult they now claim to want to solve. Clearly, Representative Blackburn and others are happy to comply with the wishes of their corporate donors -- who don't want broadband classified as a utility. Internet access is a basic consumer need for work, entertainment, and school -- just like water, electricity, and natural gas (for cooking). Internet access is a utility, like it or not. The FCC under Chairman Wheeler had the right consumer-friendly approach, despite the spin by Blackburn and others. "More than a quarter (28%) of smartphone owners say they do not use a screen lock or other security features to access their phone. And while a majority of smartphone users say they have updated their phone’s apps or operating system, about 40% say they only update when it’s convenient for them. Meanwhile, some users forgo updating their phones altogether: Around one-in-ten smartphone owners report they never update their phone’s operating system (14%) or update the apps on their phone (10%)." "owners ages 65 and older are much less likely than adults younger than 65 to use a screen lock and regularly update their phone’s apps and operating system (13% vs. 23%). Smartphone users 65 and older are also more than twice as likely as younger users to report that they do not take any of these actions to secure their phones (8% vs. 3%)..."
"... 54% of internet users use public Wi-Fi networks, and many of these users are performing sensitive activities such online shopping (21%) or online banking (20%)." A recent survey of information technology (IT) professionals by Pwnie Express, an information security vendor, found that connected devices bring risks into corporate networks and IT professionals are not keeping up. 90 percent of IT professionals surveyed view connected devices as a security threat to their corporate systems and networks. 66 percent aren't sure how many connected devices are in their organizations. These findings have huge implications as the installed base of connected devices (a/k/a the "Internet of things" or ioT) takes off. Experts forecast 8.4 billion connected devices in use worldwide in 2017, up 31 percent from 2016. Total spending for those devices will reach almost $2 trillion in 2017, and $20.4 billion by 2020. The regions that will drive this growth include North America, Western Europe, and China; which already comprise 67 percent of the installed base. "One in five of the survey respondents (20%) said their IoT devices were hit with ransomware attacks last year. 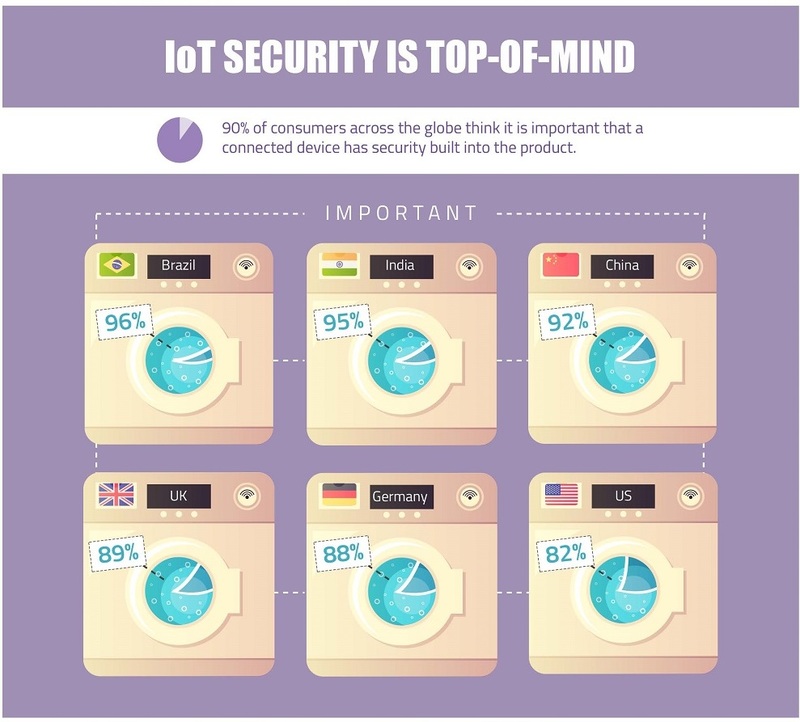 16 percent of respondents say they experienced Man-in-the-middle attacks through IoT devices. Devices continue to lend themselves to problematic configurations. The default network from common routers “linksys” and “Netgear” were two of the top 10 most common “open default” wireless SSID’s (named networks), and the hotspot network built-in for the configuration and setup of HP printers - “hpsetup”- is #2." An SSID, or Service Set Identifier, is the name a wireless network broadcasts. Manufacturers ship them with default names, which the bad guys often look for to find open, unprotected networks. While businesses purchase and deploy a variety of connected devices (e.g., smart meters, manufacturing field devices, process sensors for electrical generating plants, real-time location devices for healthcare) and some for "smart buildings" (e.g., LED lighting, HVAC sensors, security systems), other devices are brought into the workplace by workers. Most companies have Bring Your Own Device (BYOD) policies allowing employees to bring and use in the workplace personal devices (e.g., phones, tablets, smart watches, fitness bands). The risk for corporate IT professionals is that when employees, contractors, and consultants bring their personal devices into the workplace, and connect to corporate networks. A mobile device infected with malware from a wireless home network, or from a public hot-spot (e.g., airport, restaurant) can easily introduce that malware into office networks. Consumers connect a wide variety of items to their wireless home networks: laptops, tablets, smartphones, printers, lighting and temperature controls, televisions, home security systems, fitness bands, smart watches, toys, smart wine bottles, and home appliances (e.g., refrigerators, hot water heaters, coffee makers, crock pots, etc.). Devices with poor security features don't allow operating system and security software updates, don't encrypt key information such as PIN numbers and passwords, and build the software into the firmware where it cannot be upgraded. Last month, the U.S. Federal Trade Commission (FTC) filed a lawsuit against a modem/router maker alleging poor security in its products. Security experts advise consumers to perform several steps to protect their wireless home networks: change the SSID name, change all default passwords, enable encryption (e.g., WEP, WPA, WPA2, etc. ), create a special password for guests, and enable a firewall. While security experts have warned consumers for years, too many still don't heed the advice. "1. Misconfigured healthcare, security, and IoT devices will provide another route for ransomware and malware to cause harm and affect organizations. 2. Unresolved vulnerabilities or the misconfiguration of popular connected devices, spurred by the vulnerabilities being publicized by botnets, including Mirai and newer, “improved” versions, in the hands of rogue actors will compromise the security of organizations purchasing these devices. 3. Mobile phones will be the attack vector of the future, becoming an extra attack surface and another mode of rogue access points taking advantage of unencrypted Netgear, AT&T, and hpsetup wireless networks to set up man-in-the-middle attacks." The survey included more than 800 IT security professionals in several industries: financial services, hospitality, retail, manufacturing, professional services, technology, healthcare, energy and more. 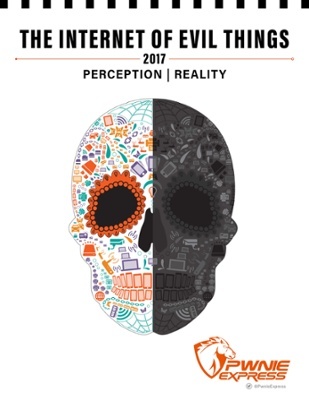 Download the "2017 Internet of Evil Things Report" by Pwnie.